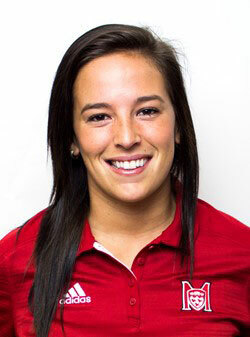 Mélodie Daoust of the McGill women's hockey was named female athlete of the year in the team sports category and was one of 15 McGill students to receive an athletic financial award before more than 650 guests at the recent Quebec Foundation for Athletic Excellence gala. Mélodie Daoust of the McGill women’s hockey was named female athlete of the year in the team sports category and was one of 15 McGill students to receive an athletic financial award before more than 650 guests at the 31st annual Quebec Foundation for Athletic Excellence gala held at the Hotel Sheraton Laval, Wednesday. The Foundation issued 76 bursaries for a total of $262,750. Laval and Montreal led all universities with 18 recipients each, followed by McGill (15), Concordia (9), Sherbrooke (6), Bishop’s (5), UQTR (3) and UQAM (2). Daoust, a native of Valleyfield, Que., who was voted league MVP in RSEQ women’s hockey last year and helped Canada win gold at the 2014 Sochi Winter Olympics, pocketed $2,000. McGill students took five of the 11 academic excellence bursaries, which were handed out to cross-country runners Melanie Myrand ($1,750) and Francois Jarry ($1,750), both natives of Lachine, Que., track & field sprinter Steven Murray ($1,750) of Burlington, Ont., basketball player Alex Kiss-Rusk ($1,500) of Beaconsfield, Que., and rugby’s Sebastien Boyer ($1,500) from the Town of Mt. Royal, Que. Other McGill bursary recipient winners included football’s Qadr Spooner ($1,500) of Brossard, Que., and alpine skier Hannah Kapur ($1,500) of North Vancouver, B.C., in the categories of athletic excellence and leadership, respectively. McGill also had seven recipients In the recruitment category, which are handed out to top student-athletes graduating from Quebec CEGEPs who chose to compete in a Quebec university sport. The group included soccer’s Mehdi Ibn-Brahim ($8,000) of Montreal, football’s Frederic Paquette-Perrault ($8,000) of Montreal and Jean-Philippe Hudon ($3,000) of Levis, Que., hockey’s Jade Downie-Landry ($4,000) of St. Jean, Que., and Louis-Philip Guindon ($3,000) of St. Joseph du Lac, Que., plus volleyball’s Claire Vercheval ($4,000) of Ste. Julie, Que. The final bursary went to hockey’s Lauren Bowman ($3,000) of Calgary, who merited her award for choosing to study in Quebec from out of the province.